I don't know the date of this photo, but Ken was a lifelong fan of the UT Longhorns. Despite that character flaw, Ken Crawford was a great person! I first met Ken Crawford when he was a forecaster in the Fort Worth, TX, Weather Forecast Office (WFO), thanks to my late friend and colleague, Al Moller. Ken then moved to Slidell, LA, as a deputy station chief (Deputy Meteorologist-In-Charge); then he became MIC at the Oklahoma City (OKC) Office, and was still there as the MIC when the office moved to Norman (OUN). Subsequently, he left the NWS and became a Professor of Meteorology at OU. At the end of his career, he left the university to be involved with the Korea's national weather service. I've made some short FB posts about this, but this blog gives me a chance to be somewhat more complete. 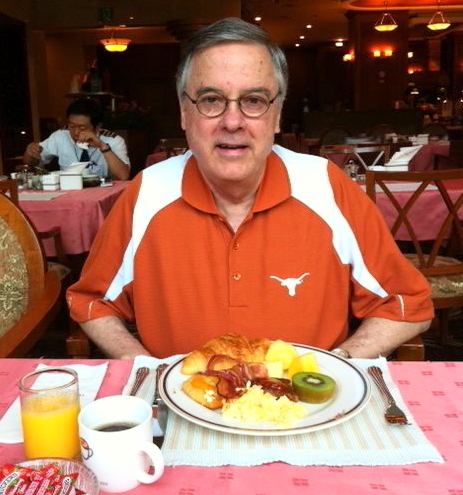 On 23 July 2014, yet another friend and colleague of mine - Dr. Ken Crawford - died. It seems 2014's toll on my friends and family continues. Although I met him many years earlier, it was when the OKC office moved to OUN (and I followed not long after, when Dr. Bob Maddox became NSSL's Director), that my interactions with Ken really developed significantly for me. Bob and I talked many times about our professional relationship with the Norman WFO across the street from our building on OU's North Campus. We agreed on what to do and so convinced Ken that it would be a good thing if a research meteorologist from NSSL had an office in the OUN WFO. Ken embraced the idea from the start, of course. I was duly ensconced in the OUN WFO and, although as a non-NWS employee I wasn't authorized to issue forecasts, I had daily interactions with the staff. Not only could I get to know and observe the people who actually made the local forecasts, but I could observe the office dynamics. Those were some wonderful years for me and perhaps I might tell that story someday, but not now. What I saw in Ken as the station chief was something I'd never encountered from a manager before. Let me illustrate that with an anecdote: When I would talk with "outside" people about the great things happening at the OUN WFO, they'd typically say something like, "Well, Ken Crawford has assembled a team of superstars there. What else did you expect?" The thing was, the group of people at the OUN WFO was, at that time, the same team (except for two people who were induced to leave the office) he'd inherited from the previous MIC. Under the previous MIC, the office had been pretty low on the respect bar and Ken had effectively transformed the staff, but used the same people!! How did he accomplish this? Ken always operated under the principle that he would not be successful as a manager if his staff was not successful in their endeavors. He understood that the people working for him aren't identical robots - they're individuals with particular strengths and weaknesses, so the idea is to use their strengths to contribute to the success of the office and to encourage them to improve in areas where they're weak. Everyone was made to feel like an important member of the team. And so the office prospered, even as his staff prospered (including winning various awards and kudos for their performance). Ken always was supportive of his staff and was willing to "buck the system" should the need arise to help his office be successful. I'm pretty confident that most, if not all of them, would have followed Ken wherever he led them, because it was clear that he reciprocated that respect. How rare that perspective seems to be! What a shame it's so rare - but Ken showed me by his actions how a good manager of people needs to operate. When I was working in that WFO office of mine, one day it dawned on me that the 35 or so NSSL mesonetwork sites were just rusting away in a warehouse, and that they might be installed as a permanent mesonet for the benefit of the WFO operations. When I brought up my idea to Ken, he then told me of his dream for a statewide mesonet that would have at least one station is every Oklahoma county!! I was floored, but quickly discarded my own paltry idea to get behind Ken's Mesonet project. He honored me by inviting my participation in the Mesonet Advisory Committee, a story all on its own and a time when I was very excited about what we were creating: the Oklahoma Mesonet. Circumstances forced me to give up my participation, but I'm very proud of what we set into motion on its way to becoming a reality. When Ken became a faculty member, I had the opportunity to be a member of some of his grad student advisory committees. I wasn't surprised to see the same overriding concern Ken showed to help those under his supervision to become successful. Ken was an excellent meteorologist, above all, and that showed in his teaching. Complex topics made sense when Ken explained them! And he sought to challenge students to improve in their weak areas, even as they used their strengths - a familiar theme, implemented in a new context. The panoply of his successful graduates is powerful testimony to the acuity of his vision for what he should do to be successful himself. His death leaves a hole in our weather community that can't ever be filled, to say nothing of the loss felt by his close friends and family. Yet, those of us who mourn his passing are supported by the gratitude we feel for having been his friend and colleague, or family member. Ken was a very, very special person, who leaves us the gift of his presence and the inheritance of his achievements. It's selfish to dwell on our grief over his absence - he'd want us to move on, capitalizing on what we do well and seeking to improve on what we do poorly, as he showed so many of us how to do in so many ways. I've been using Interpretation 3 from your PVA discussion (http://www.cimms.ou.edu/~doswell/PVAdisc/PVA.html), which you credit to Ken, for years now in my Synoptic Meteo class (see slide 15, http://www.usna.edu/Users/oceano/barrett/SO441/SO441_Lesson5_Vorticity.pptx) to explain the link between vorticity advection and vertical motion. While I still have a lot to learn (and likely do not explain it perfectly well every single time), I agree with you: Ken's explanation makes sense. I like it, too. A little told story about Ken was back in the mid 1980s the OKC WFO began issuing severe weather meso-scale discussions prior to SELS Watches when there was Severe Storms Forecast for the CWA. I was led to believe this was Ken's method to plant the idea for SELS to provide additional info prior to a watch issuance. Needless to say we got the message and around 1985 the Mesoscale Discussion was added to the SELS product stream. Currently about half the SPC staff is involved with issuing MCD products. Well said Chuck. I was at the OKC WSFO under the prior MIC who was a very nice and respectable person, but then Ken came along. I have never seen management skills like Dr. Crawford had anywhere in my life, and I am getting quite old, and have myself been a manager. Ken had the unusual ability, and heart to involve ALL members of the staff in meetings and projects. He lifted the entire staff from secretaries to met techs to mets all together on entering the building. I am saddened to the max to see him gone. He touched my life in such a big way. It was sad to learn of the passing of Dr. Ken Crawford. He will be sorely missed both personally and professionally. I first met Ken at a conference held in New Orleans in 1973. I was fortunate to have the oppurtunity to work with Ken the following two decades, until I retired from the NWS in 1995. Ken was a humble and generous person. He was always willing to share his wealth of knowledge. He was also a good listener, receptive to ideas brought forth by others. His accomplishments while working for the NWS, at "OU" and for the state of Oklahoma are well documented and earned him richly-deserved recognition. As a friend and former colleague, the highest rank I can bestow on this scholarly but down-to-earth person is: Ken Crawford was a lifelong student of Meteorology and related sciences.